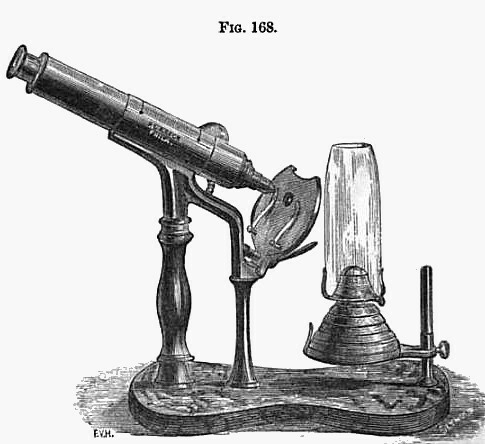 Holmes's Class Microscope. This instrument (Fig. 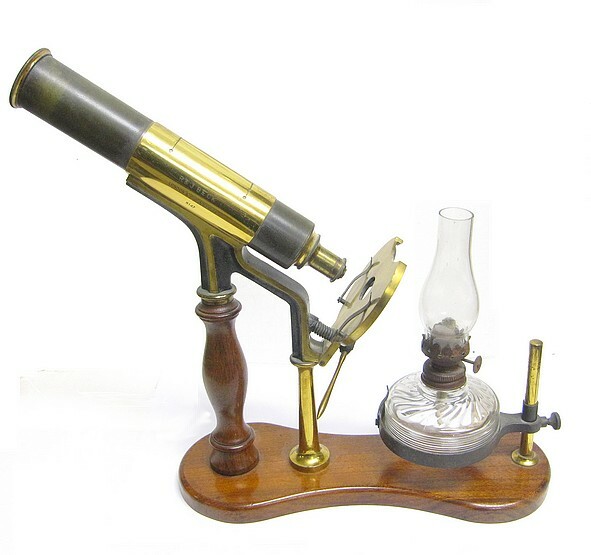 168), the design of Dr. O. W. Holmes, of Boston, U.S.A., is substantially a modified form of Beale's Demonstrating Microscope, except that the tube is not in a horizontal but in a suitably inclined (fixed) position. The wooden pillar on the left forms the handle for passing the instrument round the class. The coarse adjustment is effected by sliding the body through the outer split tube. 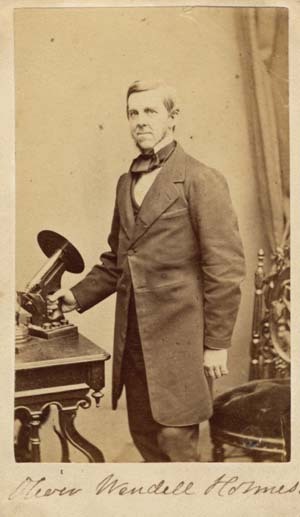 The height of the instrument is about 12 in., and the size of the base (on which it stands for ordinary table use) 12 x 4 inches. A special peculiarity is in the fine adjustment, which is effected by moving the stage. For this purpose the stage is suspended by its lower edge to a metal hinge. A somewhat coarse-threaded screw attached to the limb, and having a strong spiral spring coiled round it, passes through the stage, and is acted upon by the nut with lever-arm seen beneath. The lateral movement of this lever-arm in one direction causes the stage (which is held between the spiral spring above and the nut beneath), to tilt up from the hinged joint, the spring forcing the stage back again when the lever is turned in the reverse direction. The motion is therefore not strictly at right angles to the optic axis, but for low-power work this is hardly of consequence. 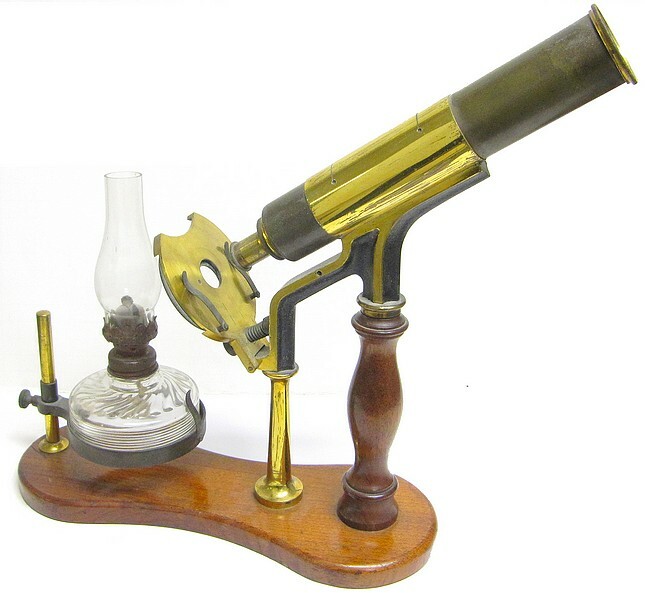 In lieu of a condensing lens for opaque illumination, a mirror with three arms, joined by ball-and-socket movements, is attached to the limb. 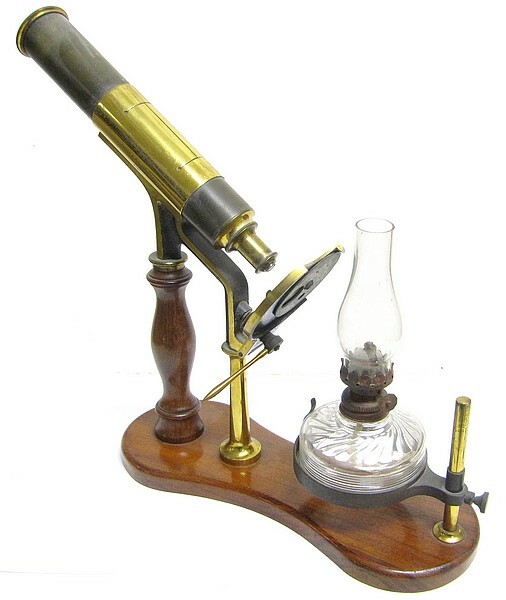 The ring which carries the lamp can be variously adjusted on the standard, to suit the convenience of observation. 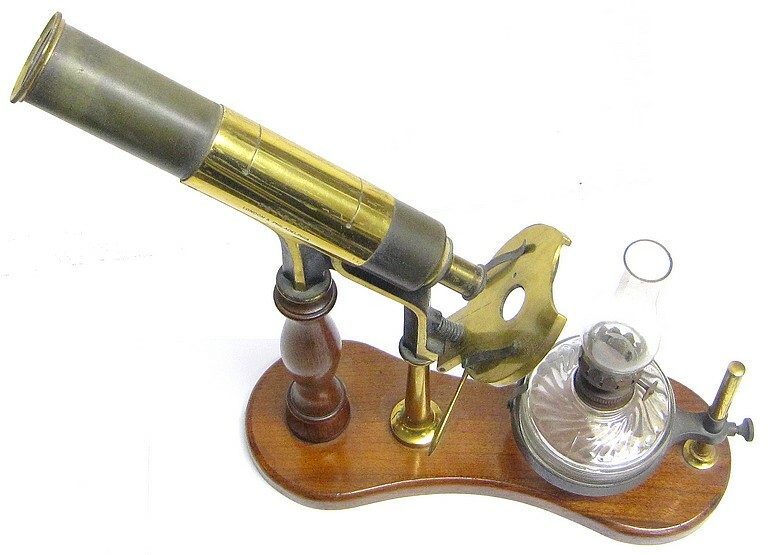 Another similar classroom demonstration microscope made by R&J Beck with serial number 8264 is said to have been used by Oliver Wendell Holmes. It resides in the Warren Anatomical Museum at Harvard University. An incomplete example similar to the one on this page is located at the Science Museum, London (inventory number A168233). An addition one is also here.